When my husband and I had the crazy idea to plan a wedding in three weeks, the only thing we knew for sure was that we were flat broke. I probably had a few thousand in savings and my husband had none. We were broke and in love and hell bent on getting married. An elopement wasn’t an option for us as we both really wanted our families to be there. However, we had to cut costs in major ways. 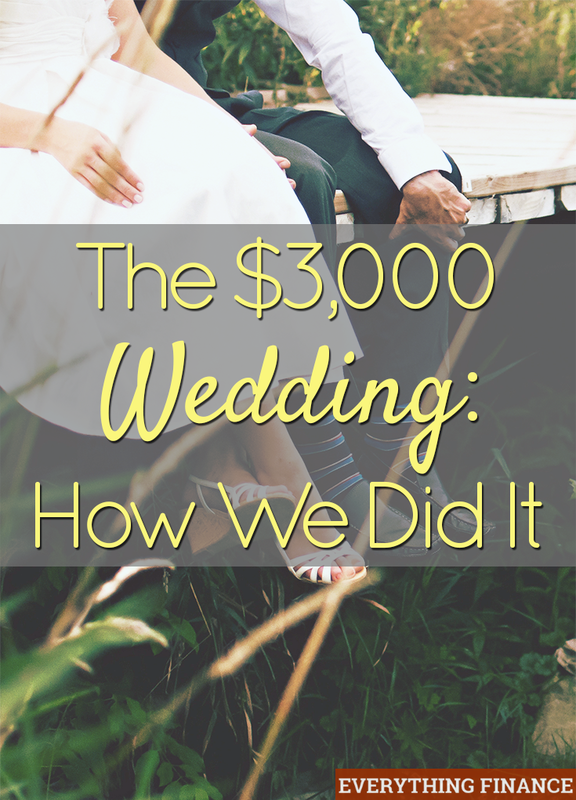 This is how we pulled off our $3,000 wedding. These days, even churches will charge a minimum of a few hundred dollars to host a wedding ceremony. And most charge even more than that. While I checked with my church about hosting a ceremony, the $1,000 price tag was not going to fly. We ended up going with a courthouse ceremony. We actually rented out an old historic courtroom so that our family and friends could be present. This courtroom has been used in several movies because of its “old courthouse” look and feel. Besides $100 to rent the room, we also paid for the marriage license (about $100). By limiting the invite list to only our closest friends and family, we were able to host the reception in my parents’ backyard. My parents actually have a really great entertainer’s backyard, so it worked out nicely. We rented linens and tables, and added some nice flower arrangements, and some old-fashioned light bulbs were already hung. It really looked quite lovely. For entertainment, we actually had a Mexican Trio play songs. It was mostly background music but it upped the wow factor of a backyard reception. Everyone loved the food. We didn’t do a cake, and instead opted for a dessert table. My family loves to drink, so there was plenty of wine and beer to go around as well. I actually ended up buying my dress off the rack at Macy’s for $40 insteed of our original plan to buy it from terani couture. I loved my dress too and felt like a Greek goddess. I only had an afternoon to go dress shopping so I considered myself extremely lucky. It looked a lot like this one. Eric wore a suit that he had. We also did not have a wedding party, so no need to buy groomsmen and bridesmaid gifts. We ended up notifying everyone of the address and time of reception through email, so we didn’t have any invitations. A family friend worked as our photographer and my brother was videotaping with our camera (who really watches their wedding video anyway?). We rented a hotel room for our honeymoon night and then took a short weekend getaway to Temecula for a mini-honeymoon. (We splurged almost three years later for a trip to Costa Rica as our “real” honeymoon). For the rings, we bought ours at Sam’s Club and paid about $300 for both. All in all, the $3,000 didn’t even come out of our own pockets. My parents graciously footed most of the bill, with Eric’s parents helping to pay for the alcohol. Eric and I only took care of our own items such as wedding bands, honeymoon, and outfits. I hope that people can come to realize that money shouldn’t be an impediment to having a nice wedding. While the truth is I would have loved a fairytale wedding, the reality is that I will never be able to afford a wedding like that no matter what time in my life. Additionally—do I even want to spend that kind of money on one day? Ultimately, I wanted a marriage, not a wedding. And I was very happy with how our $3,000 wedding turned out.